The selection of Roberto Azevedo as Director General of the WTO last week has set the stage for the BRICS to increase their influence in shaping global economic affairs. This is the first time since the creation of World Trade Organization (WTO) in 1995 that a member of BRICS will be leading the organization. Brazilian President Dilma Rousseff welcomed the development and stated, “For Brazil it is clear that, given his commitment and experience, he would be able to lead the organization toward a path of a fairer and more dynamic global economic order.” Azevedo has represented Brazil at the WTO since 2008. He will succeed the current French head of the body, Pascal Lamy from September this year. He defeated the rival candidate, former Mexican Trade Minister Herminio Blanco. The selection of Azevedo will impact the policy focus at the 159-member international trade body. The developing countries led by the BRICS will have a greater say on contested issues related to agriculture and subsidies; – the issues which have been unresolved due to polarization between developing and developed countries since the Doha round of WTO in 2001. The issue of interest rate is also a contested issue between the members of the body. While the developed countries have almost pursued near-zero interest rate for the growth of their economy, the developing countries have opposed such economic measures. The rising profile of the BRICS has also attracted other countries to seek its membership. Egypt’s President Mohamed Morsi during his visit to Brazil early this month sought the membership of the grouping. 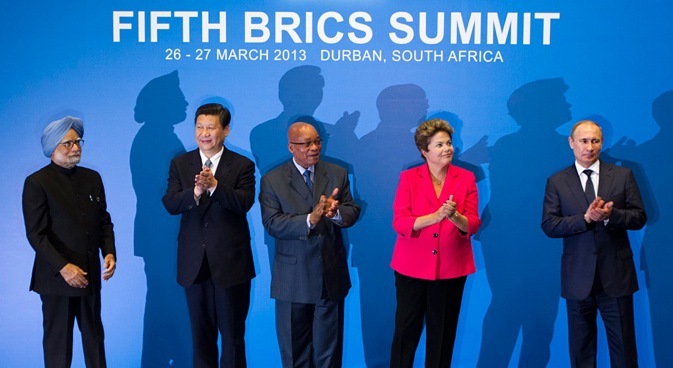 Morsi had attended the BRICS summit in Durban in March this year. During his Brazil visit, Morsi reiterated “Egypt is exerting utmost efforts to join the BRICS by achieving a real development in all fields.” The members of the grouping have to take a decision about Morsi’s appeal for membership. BRICS officially emerged as a single bloc without South Africa in the Russian city of Yekaterinburg in 2009. South Africa joined the grouping in 2011. In case of Egypt, it has undergone financial crisis particularly after the domestic upheaval in 2011 and the budget deficit as per an estimate in April this year was about 10.1 per cent of its GDP. However, Egypt is a crucial player in Arab world with potentials to be a leading economy in the region. Perhaps, the leaders of the grouping have to lay out criteria for admission of new members to the grouping. As the profile of the grouping is set to grow in coming years, its attractiveness to other nations in terms of membership will also grow. Though BRICS comprises of fast growing nations with high geopolitical and economic clout in the world, it cannot close its doors to other nations though it can have certain requisites for admission of new members. The Finance Ministers of the BRICS countries met in Washington last month and deliberated on the BRICS development bank, originally proposed by India during the New Delhi summit in March 2012. Indian Finance Minister, P. Chidambaram after meeting his counterparts stated that “The BRICS finance ministers met in Washington and we reiterated our commitment to the BRICS bank.” He further added, “Before we go to Brazil for the next summit, that is one year from Durban, we hope to complete our homework.” He further emphasized that the ministers are working on details of the bank including two major issues of its capital and its location. The South African President Jacob Zuma while addressing World Economic Forum on Africa last week argued that the membership of his country of BRICS has certainly raised its profile, and also provided the other members of the grouping vast market of Africa for investment. He portrayed South Africa as a gateway to Africa with more than one billion population and with huge resources. There is also a proposal to connect all the member countries through cable network for better communication between them and for lessening their dependence on developed countries for this purpose. About the establishment of the BRICS development bank, Zuma argued, “Part of the reason we thought it was important to establish the bank is because we needed a bank that could respond to opportunities and the needs of the developing world, not just the rich world. The bank is about the developing countries.” He expressed confidence that by the time next summit in Brazil commences, the bank idea will be approaching reality. The profile of the BRICS will certainly grow with the growth of the member countries. The members have grown despite a global economic slowdown. Their status will grow further with passing years. At present the members represent 40 percent of world population and 25 percent of the world’s GDP. The elevation of one of its members as the head of WTO will certainly add to the voice of developing countries and help shape the evolving global economic order. Besides its economic clout, the grouping has also to play a political role in global affairs. It during the Durban summit advocated for a political transition in Syria, and peaceful resolution of Iran issue. Whether it is confronting increasing tensions in various parts of the world including in the Middle East or handling transnational issues like terrorism or drug trafficking or building war-torn societies or shaping international economic order, BRICS can play an effective role towards bringing fairness and equality in global affairs.